We want to think so. But then look at the GX7 - smaller, lighter, feather weight lenses. 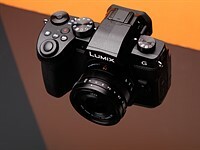 Why buy a heavier, bulkier camera if the resolution is basically the same? Mind you, I haven't seen reliable DR figures yet from either - (sensorgen is the only one worth looking at). But my suspicion is that the Panasonic is excellent. But I think Fuji will have to get a bigger or higher resolution sensor to stay competitive because it seems unreasonable not to do so. I was interested in the XE1 because it was small and light, albeit the lenses were kind of heavy. But now, the XT1 is here and it's...huge. For that kind of bulk and same weight, I think I would rather the A7.